Local television sportscasting has always provided a vital daily link between fans and the athletic endeavors they support and follow. From the day in 1958 when he signed WKBW-TV on the air, until his retirement in 1989, Rick Azar filled that important role for Western New York sports fans, and no one has ever filled it in better fashion. A product of St. Joseph’s Collegiate Institute and Canisius College (and a proud recipient of that School’s Distinguished Alumni Award in 1989), Azar initially turned to acting. Rick studied acting in New York City, and toured with a national Broadway acting company. Azar’s resume also features stints as an amateur drama coach and violinist who once gave a recital at Kleinhans Music Hall, and host of Buffalo Bandstand. 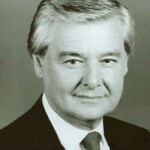 However, he eventually found his home at the desk next to Irv Weinstein at Channel 7. For over 30 years, Rick made his viewers “eyewitnesses” to the greatest moments in Buffalo sports history. Azar was at the Aud when the puck was dropped for the Sabres’ inaugural home game in the National Hockey League, and he was in the Shea Stadium broadcast booth the day the Bills O.J. Simpson broke the 2,000-yard barrier against the New York Jets in 1973. Western New York viewers and listeners can recall hundreds of other significant moments as related by Azar’s familiar voice. Those moments included the triumphant and the tragic, soaring satisfaction and deep disappointment, all relayed with unparalleled dedication, enthusiasm and integrity. Although an aggressive sports reporter and excellent interviewer, Azar’s podium was the sports anchor desk from which he delivered hard-hitting commentary and in-depth, behind the scene analysis. The sports airwaves now abound with anchors who “tell it like it is,” but Rick was the true original, an on-air personality who went far beyond “rip and read” sports reporting to usher in a new era of sports journalism in Buffalo. Although Rick never manufactured controversy for the sake of ratings, he also never backed away from emotional topics. Azar was (and is) basically a fan at heart, and his genuine affection for sports led to warm, mutually respectful professional ties to many of this area’s greatest athletes and coaches. Rick covered them all, from Punch and Perreault to Kelly and Thomas, from Saban and Shaw to Bowman and Ramsey. On the other hand, Azar seldom lost perspective on the proper place of sports in society. He once observed that “Sports is not the most serious thing in the world.” In that spirit, Rick always searched behind the scores and the headlines for the human element of a story. For instance, on the occasion of the controversial 1981 trade of Jim Schoenfeld and Danny Gare to Detroit, Azar mourned not merely the on-ice loss to the Sabres but the off-ice loss to the community. Since retirement from Channel 7, Rick has enjoyed the privilege of honoring former Buffalo athletic standouts as a director and former president of the Greater Buffalo Sports Hall of Fame. In 1997, the Hall honored Rick for his years of dedication to the enhancement of our enjoyment of sports, one of the great passions of Western New Yorkers.